For the recent half-term holiday week, Hayley took a much-deserved couple of days break with some girlfriends at a nice hotel in the Peak District. This gave me the perfect opportunity to get creative with the kids and produce a nice gift for her into the bargain. 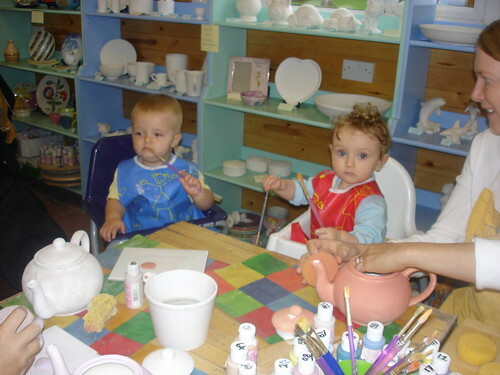 We took ourselves 20 minutes down the road down to Paint-a-Pot at the Bluebell Centre. Hayley has taken both kids there previously. 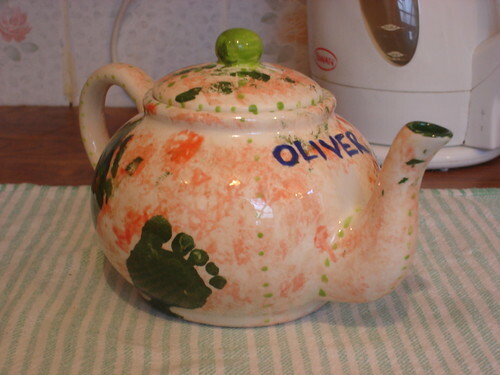 Firstly, Oliver visited back in 2006 (pictured below) and made a rather lovely tea-pot. Later, Lucy decorated a vase for her Nanny. 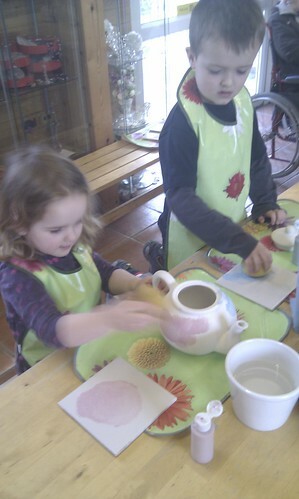 This time, as they are older, rather than apply hand-prints and footprints, I decided to let them paint as they pleased. 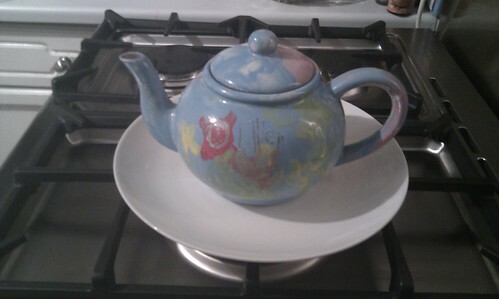 The item we chose to decorate was a tea-pot, not least because our existing tea-pot had developed a worrying looking crack. Oliver took one side and Lucy the other. Obviously Lucy went all out for different shades of pink, occasionally being persuaded to adopt other hues, before finally reaching for the pot of black! Meanwhile, Oliver decided to offset the girly pink with boyish blue. He also managed to write his name on his side by himself. 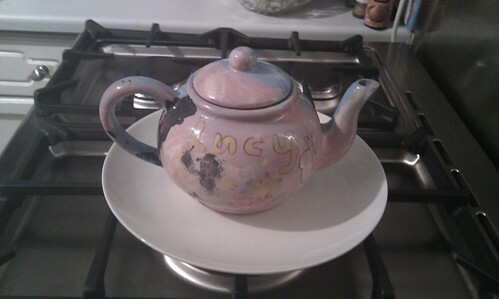 No mean feat using a pencil on a wet tea-pot. When our painting was done we played various games in the garden: tig, a “sneaking up on each other” game and also races round the gardens, taking opposite directions and seeing who got back first. The kids also enjoyed the little playground there. We had lunch in the restaurant, which shares a kitchen with the pub next door apparently, so you can take your choice. All in all we spent the bulk of our day there and had a great time. I was feeling quite pleased with myself for entertaining them so well until at bedtime Oliver told me his favourite part of the day: the car wash on the way home! 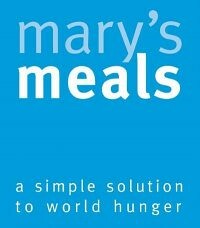 The information listed here is very informative. I have been taught a number of techniques.